There are times as a photographer that you have to make the best of what you’ve got, where you are and how much time you have. I was on a family skiing holiday and initially considered only taking my iPhone as a camera. I was here to ski! This was our first day and I had a lot on my mind. We had skis to fit, passes to collect, an instructor to find and it was the first time my two boys had ever been skiing. The forecast was for challenging -10°C, 50cm of fresh powder. I knew I had to take a daypack so stashed my smallest camera and lens inside not expecting to use it. I once severely bruised my ribs wiping out with an SLR stashed in my jacket pocket. 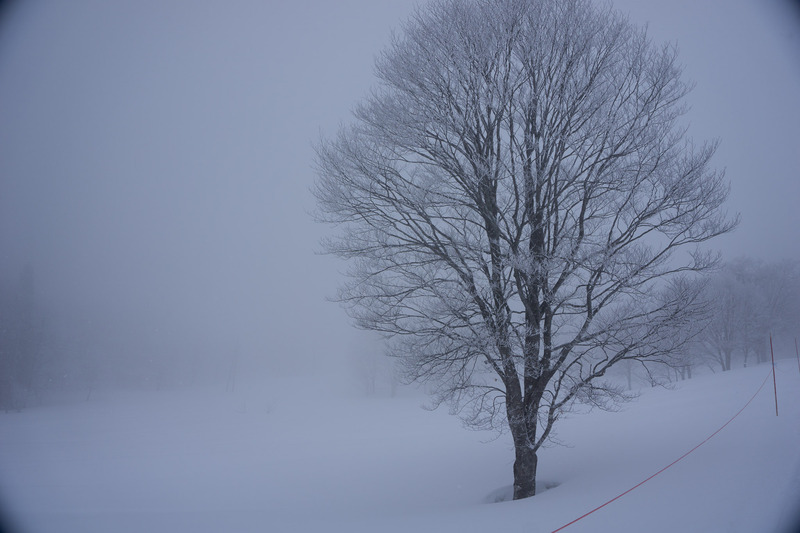 Progress was slow, we had deep fresh snow, a very flat run and a seven and eleven year old who had never been on skis. Our instructor, Kevin, a very mellow Swedish chap, had the patience required to deal with the situation. He yo-yoed back and forth, picking up one child after the other, giving words of encouragement and the occasional tow. My wife and I circled, assisting when we could. 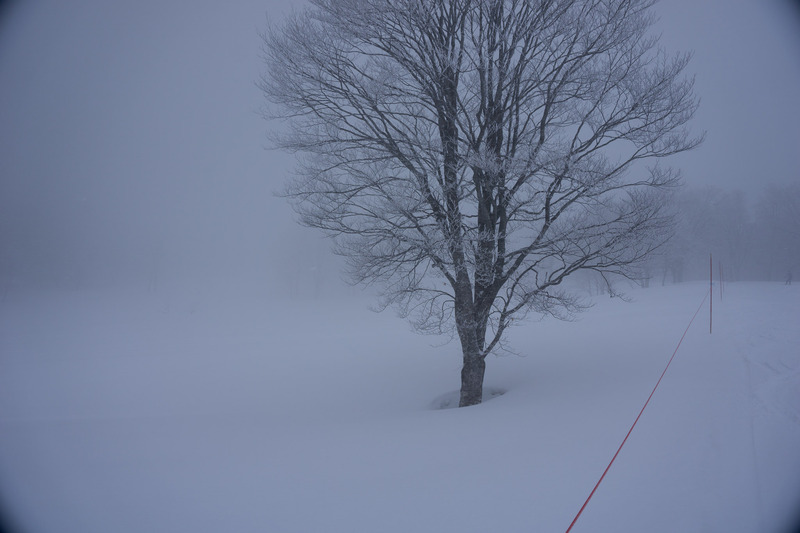 Visibility was down to less than 50 feet, the run deserted, wide and unknown. My biggest fear was loosing a child in the near white out conditions. Kevin had no such concerns and once I skied Uenotaira on a clear day, I understood why. I was not only relieved when the snow fall abated but also astounded as the scenery revealed itself. Here, next to me, was a lone tree, decorated in frost and snow, an image I had wanted to capture for many years. I hadn’t prepared, my kit was set up for family snaps. I dug into my rucksack and grabbed my camera. Snow was still falling but now in soft flurries. A large clump fell right on the viewfinder, any attempt to clear it futile. I took three hasty point and shoot shots aware I only had a a minute as our party was disappearing down an unknown slope. My mind flooded with regret at not packing a tripod, then the sensible part of my brain reminded me that skiing with a tripod on a family holiday was insane. Later that day at lunch, I reviewed the photos I had taken that morning and I felt disappointed that of the three shots, I’d failed to capture the whole tree. In my minds eye, I saw the possibility of stitching but it would probably be a waste of time and I’d be better off returning to the spot with more time and composure. When I loaded them onto my iPad in the evening, I saw the dark vignetting created by the less than perfect kit lens I was using, so no option to stitch. Circumstances dictated that the conditions and timing weren’t repeated. Managed to get the top of the tree but cropped the side. Back home I loaded the images on to my computer using Lightroom (LR). I’ve been using LR for many years and it’s my cataloguing software of choice. Until recently, that was it’s only use. The lone tree was there, at the top of the grid layout, one of the first photos I had taken on the trip. I decided, what the heck, lets see what I can do. I wasn’t going to give up. I processed all my images outside of LR. It does however have a useful tool in the development module under Lens Correction – Enable Profile Corrections. One click and the vignette had gone. It also corrected the lens distortion which is pronounced on the wide end of this lens. If I was going to stitch three images together, then this was going to be a problem. When you’re merging images, it’s not a good idea to do any processing until after stitching. The correction had warped the the three images, straightening verticals and horizons. I used the LR Photo Merge -> Panorama tool as a test. Fail. For years I’ve been using PTGui Pro, but it has limitations and the results were a disaster. It didn’t like the combination of horizontal and vertical images. As you can see, this wasn’t going anywhere. I had a third option though. I had recently started using Autopana Giga and it did an excellent job, the three images stitched together seamlessly. There was clearly a lot of work still required. I corrected the distortion and now had a nice juicy 16 bit image to work on. I wanted to give the tree some space on the left, I liked the way the valley dipped on the right but if I cropped with the tree in the middle of the frame, it would feel unbalanced. By bringing out a little detail , extending the image and including the slight rise on the left, the image felt more balanced. I didn’t have all the pixels I needed though and there was a big chunk of empty space bottom left, an area I had failed to capture. I would fix that later along with the guide rope, but first I would tone. I use Nik collection a suite of tools for most of my processing. The merged image was loaded into Photoshop (PS). 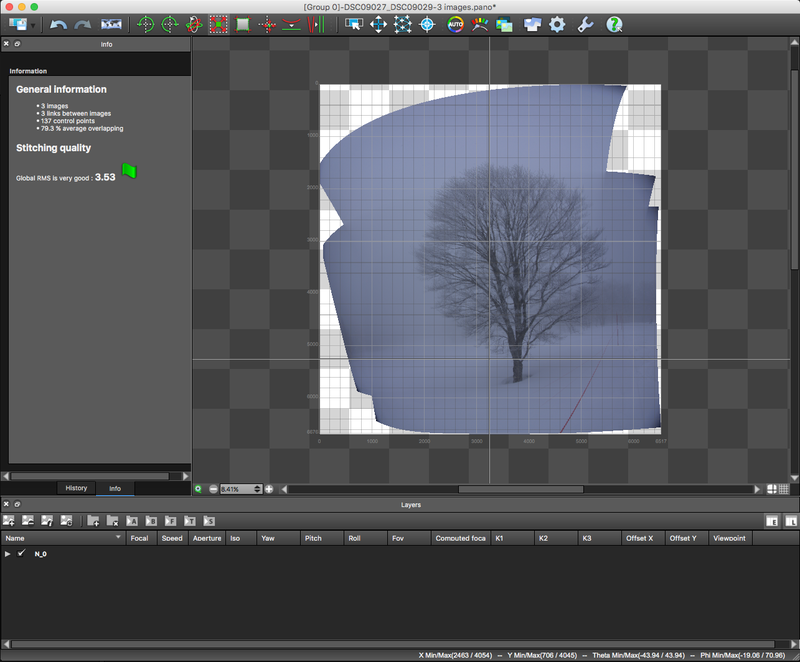 The Nik tools are all plug ins, so I can process everything form within PS. I used Color Efex Pro (CEP) global controls to set the tone and hue of the final image. 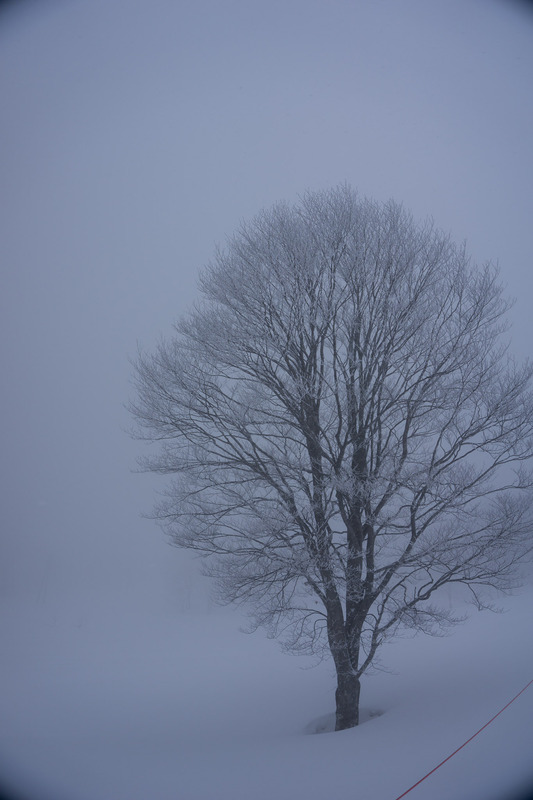 I wanted to recreate the cold conditions I had witnessed, the ethereal light and dark tree. I used control points to bring out subtle detail in the back ground, the trees in the background that would help the balance I wanted. Back in Photoshop, I fixed the missing section bottom left. Fortunately the area has very little detail and therefore my clunky PS skills managed to do an ok job. Looking back now with some experience and feedback, it’s a little too bright and an image like this could easily take a little vignetting. PS has an excellent heal tool and the rope was removed with a couple of strokes. Lastly I created a tweaked curves and levels, added a 30% layer of soft blurred light and exported as a high resolution JPEG at 100% – job done. I subscribe to the school of art, that says once a piece is completed, then the only thing that remains is the final image. Once the JPEG was backed up, I deleted all the working files. This level of certainty is refreshing, it creates self belief which is something I need. It was critiqued online and although the suggestions were very useful and insightful, the image remains as it is, unaltered. As an apprentice a The Arcanum, I’m currently keeping my working files as I may have to revisit and incorporate feedback during some of the critique tasks. This is my first post on my new photography blog. I’ve been blogging for nearly a decade and started many failed photo blogs. For the first time though, I have a clear vision of what I want my blog to be about. This is about the story, the words behind the image. I will share where and why I took a picture, the numbers from the camera, the process and thoughts. It’s a record of my development as a photographer, an archive and history. I intend to post as often as I can.